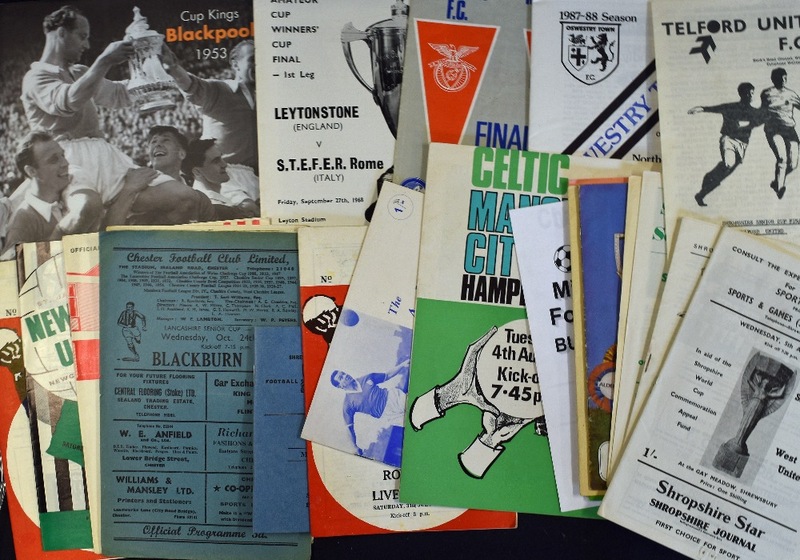 Selection of football programmes to include 1962/1963 Chester v Blackburn Rovers (Lancs Cup), 1965/1966 Newcastle Utd v Moscow Dynamo, 1968/1969 Sunderland v Werder Bremen, 1967/1968 Newcastle Utd v Hibernian, 1971/1972 Tranmere Rovers v Manchester Utd v Liverpool; 1970 Celtic v Manchester City, 1965 Arthur Rowley Testimonial Brochure, 1966/1967 Shrewsbury Town v West Ham Utd, 1968/1969 Wellington Town v Shrewsbury Town (Final), 1969/1970 Telford Utd v Shrewsbury Town (Final), 1970/1971 Telford Utd v Shrewsbury Town (Final), 1970/1971 Shrewsbury Town v Stoke City (friendly), 1969 FLC Cup Final match, 1971 Welsh Amateur Cup Final, 2012 Butler Cup Final, 1987/1988 Oswestry Town v Mossley Northern Premier Final, 1968 European Cup Final, 1968 European Amateur Cup Winners Cup Final. 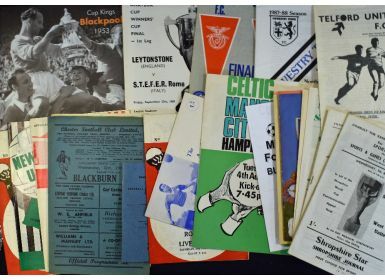 Also has Cup Kings Blackpool (1998 book of 1953 cup winning team – Stanley Matthews signature – limited edition 324/1000). Fair-Good.